The DPP260 high speed blister packing machine is advanced equipment designed to apply heat and pressure to form a secure blister package around your finished goods. Blister packaging is one of the most commonly used processes for product packing because blister packs protect products from external factors such as moisture and microbial contamination for extended periods. Our blister packing machine employs a sophisticated PLC control system that gives the operator total command of the electric, mechanical and gas components. The machine is designed to meet all GMP standards and the innovative design allows for simple operation even for complex production processes. This machine is suitable for large scale blister packaging of food, cosmetics, hardware, medicine and other health-care related products. 1. Advanced PLC controller with touch Chinese/English touch screen interface. The machine features a frequency inverter for precise speed control and servo traction, ensuring flexible packaging options. 2. Designed to work with PVC and PTP materials, the blister packing machine is designed with a temperature control and test function to prevent overloading or burning. The machine automatically debugs, alarms and shuts down in case of equipment failure. 3. 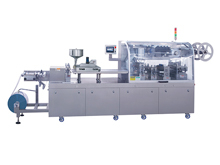 The blister pack sealing machine is modular in design and fits right at the end of your production line. This facilitates convenient and efficient operation. 4. Superior packaging performance with the thermal contact type, positive press form air cushion seal with an upper and lower net. 5. The PVC exchange support has large type material support capability with a whole roller, making the whole machine outstandingly practical. 6. The package molds are specially designed with a rectangle shape and are fixed in a ladder structure that facilitates convenient replacement. All contact parts are produced from high quality stainless steel and aluminum components that are specially heat treated. 7. The blister packing machine neatly discharges finished products and automatically separates defective packages. Strap materials are automatically rewound to ensure easy collection. 8. Efficient, reliable feeding with a variety of arrangements and irregular feeding options. 9. The body of the machine is compact and lightweight which makes it easy to move around workshops and lifts. FEIYUN offers this DPP260 high speed medicine pack blister packaging machine with capacity of 140 thousand grains/hour of aluminum and PVC blister packaging, and 75 thousand grains/hour of aluminum and aluminum blister packaging. Besides this, FEIYUN, as a reliable pharmaceutical machinery manufacturer, also provides pharmaceutical tablet coating machine, rotary tablet press, vacuum homogenizing emulsifying mixer, capsule filling machine, medical high purity nitrogen generator, and so on. Looking for well qualified pharmaceutical equipment? Please contact us and we can provide products that meet the pharmaceutical cGMP standards.